Our tour of Southern California's independent haunts continues with a trip over to Anaheim, in the shadow of the Disneyland Resort, where we check into Motel 6 Feet Under to see how this fun, charming, throwback-style haunted house has in its bag of tricks for its sophomore year as a standalone and self-named haunted attraction. Guests mingle outside Motel 6 Feet Under before checking in. 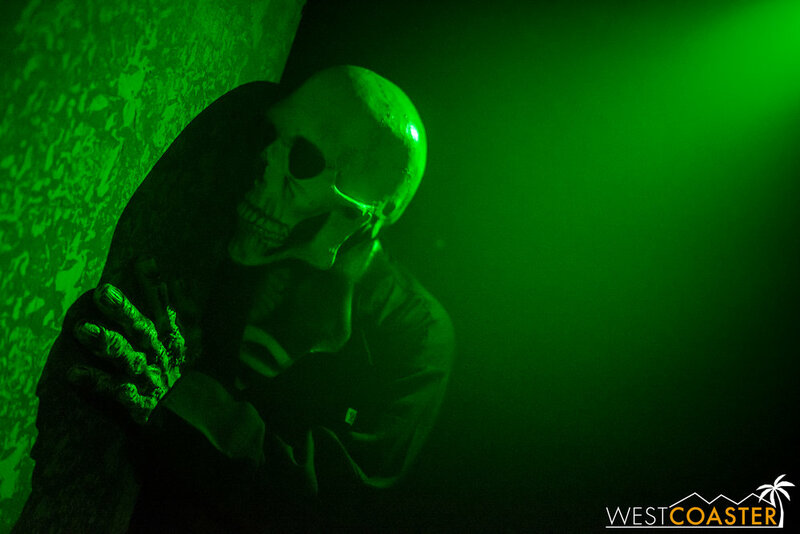 Although the producers of Motel 6 Feet Under have created a haunted house attraction over the past seven years--most of them in conjunction with the city of Anaheim's annual Halloween festival--last year's iteration was the first year that Carolyn Carpenter and her family and team staked out the attraction as a stand-alone, independent haunt. And 2015 saw Motel 6 Feet Under break out as a surprise fan favorite, in large part because it's old-fashioned haunted house vibe, disorienting and dynamic layout, and good ol' carnival-style scary fun proved to be an addictive and relatively family-friendly offering that stood out among the sea of ever-intensifying haunted attractions in and around Southern California. Much like movies, music albums, and children, it's rather challenging to come up with a successful second year maze after a popular and very well received first. However, Motel 6 Feet Under has risen to the challenge with another fun and fantastic maze that carries the same whimsy and frightful fun that marked last year's maze, but with some technical and operational improvements and a few new tricks to boot! The lobby inside is a cacophony of haunted madness, with old props and furniture adding a pleasantly spooky aged vibe. Multiple corporate sponsors have helped provide support and financing for this haunted attraction. This year introduces guests to a new character, Mable, who has taken over the motel and wants the guests to be her residents forever and ever. Quite the prankster, Mable manipulates the motel into an ever-changing network of rooms and corridors, sending guests going back and forth and altering the paths to ensure that they are never able to check out. Perhaps all she wants to do is play, but an encounter with her is one that check-in's may not survive! The result is a new layout different from last year, with some elements that visitors in 2015 may recognize plus elements that are unique and thrilling. As was the case last year, there are portions of this haunted maze that are an actual maze, and aspects of the layout that may actually lead people astray. In addition, a cornucopia of hidden doors and passageways creates a disorienting and confusing course amplifies apprehension causes just enough second-guessing to add some suspense into the experience. As with last year, the actual live talent is rather scarce, and many of the scares and effects are the result of animatronics, puppetry, illusions, or video projections. But that is what makes this maze fun--it never sets out with the intention of being the most extreme or scariest. ...a lamp and old clock there. 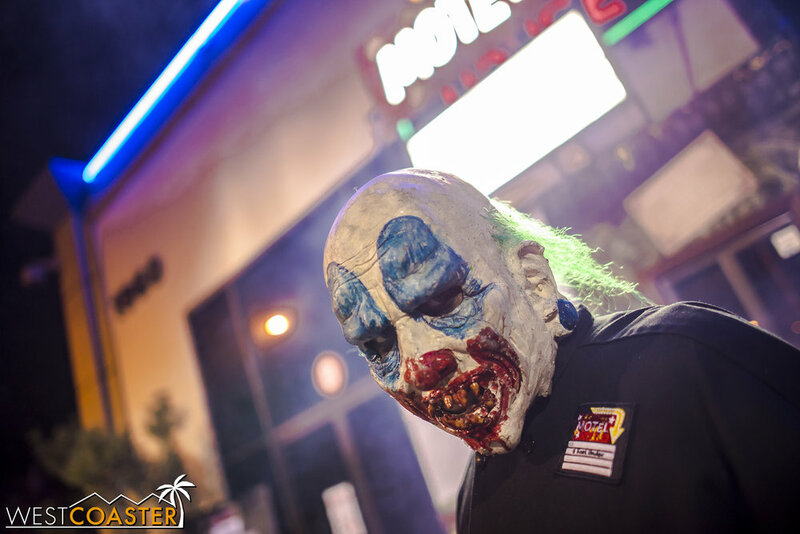 Motel 6 Feet Under aims to startle, for sure, but its aim is to bring back the old family fun frights feeling of Halloween from yesteryear--the kind one might find at a haunted house dark ride inside a carnival. The theming may not be hyper-realistic and gory, and the robotics may not be perfectly lifelike and fluid to Disney standards, and there may be some familiar types of scare scenes, but it all still results in the innocent glee that most everyone remembers experiencing from their trip to the county fair or autumn festival. And considering that all of the effects and animatronics are custom created--many of them by Carolyn's brother, David, it's pretty evident that there is a lot of heart within this haunt. Plus, because this is not an ultra-intense, violent-looking, explicit-content maze, it's a great candidate for haunters looking to bring interested but still slightly timid newcomers to the scene, be they older elementary school aged children or adults who aren't too warm on the Knott's Scary Farms of the world but don't mind innocent scares. That's not to say that all of Motel 6 Feet Under is exclusively familiar trope either. This year, there are several moments that involve some creative use of scare tactics, including scares from unexpected directions, effects used for disorientation, and a finale that actually succeeded in getting a fantastic startle scare out of me--primarily because I have never seen any haunt do this before, and I find it incredibly brilliant. The intimate indoor queue definitely sets the tone for the overall aesthetic and level of detail of the maze--nothing too elaborate, but still well stocked and certainly respectable. On top of all this old-fashioned Halloween entertainment, Motel 6 Feet Under is set up to support B.O.O. : Building Occupational Opportunities, a non-profit organization that trains and teaches underserved individuals skills related to carpentry, electrician work, mechanical design and programming, lighting, and other practical skills that can help them find tangible jobs and help themselves into better circumstances. It's no coincidence that these skills also relate to what is needed to build a haunted house attraction. B.O.O. members help with the construction and operations of the maze itself, and the training they receive provides experience for them to obtain other jobs and obtain the dignity of employment. Otis the elevator operator is one of the first characters guests meet. Once guest check in, there's a cavalcade of other spirits to greet them, though. Playful Mable creeps around throughout the maze. You never know where she'll appear. Many of the props and effect fall under the "fun and spooky" category. As far as blood and gore goes, this haunt is very light on it. What it IS high on, however, are doors, dead ends, and trick passageways. The theming runs across several traditional types, such as ghosts, clowns, and monsters. 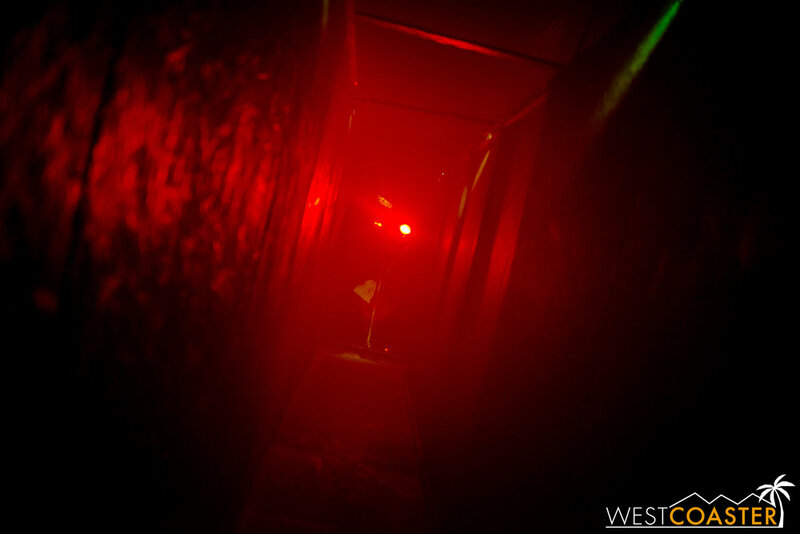 The blinding glow of a red spot is one of my disorienting devices used in the maze. Scenes unfold in that carnival aesthetic--nothing intricately detailed, but enough to convey the idea in that charming, innocent way. Black light and glowing paint are heavily employed. And a nice collection of moving props adds and homey and cozy feel to things. The animatronics are all basically custom build and done by the Motel 6 Feet Under team. And there are many moments that will remind guests of haunted fun houses too. 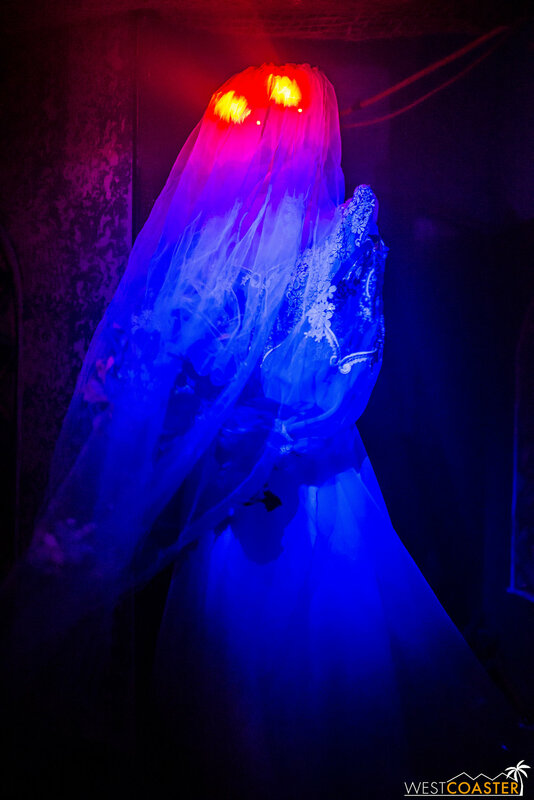 This bride makes for a macabre matrimony. And you can't have an old-fashioned haunt without scary portraits. The holographic effects are just fun. I use that word repeatedly, but that's honestly the best way to describe this haunt. A monster lurks in search of a lost victim. Outside, the "street talent" has expanded. 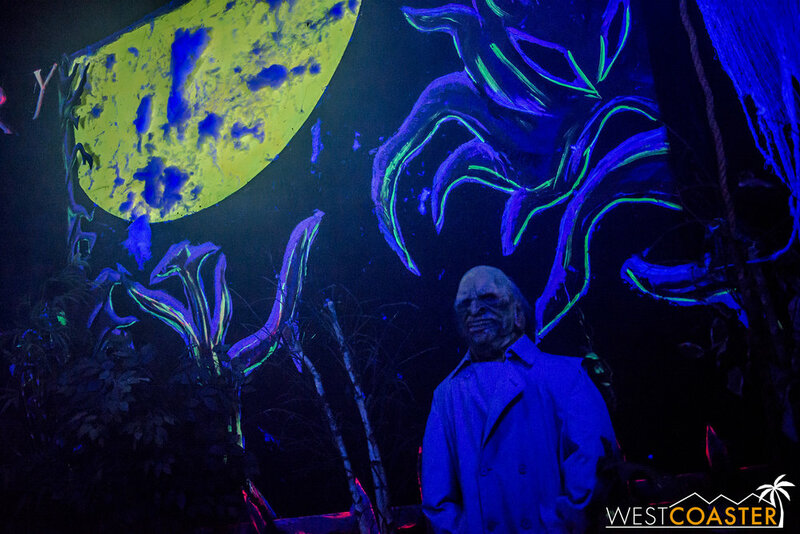 Returning guests will recognize this monster, who has sort of become the "face" of the event (and what a face!). But Victor the Clown has also joined in the prowl. And, perhaps capitalizing on the current creepy clown hysteria, he adds a few scares to unsuspecting passers-by too! All in all, reservations are in good demand, so definitely stop by for a visit! With a fun theme and wonderful cause, Motel 6 Feet Under is a very worthwhile haunted attraction that deserves broad support and will leave guests giddy with the feeling of the Halloween of their childhoods. Because of the nature of the layout and flow of the maze, lengthy lines can form on popular nights. To mitigate this, it is recommended for guests to come early. Front of line passes are also available for a higher fee. Further information can be obtained at Motel 6 Feet Under's web site. This attraction runs until the weekend after Halloween, so there is plenty of opportunity to visit. It's central location in Anaheim, near Disneyland and just off the I-5 freeway (on the east side) on Anaheim Way between State College Blvd and Katella Ave, makes it pretty convenient for most Southern Californians to visit. Go check it out and support a wonderful organization. I recommend it!